↑ Sources conflict. 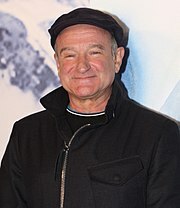 The print biographies The Life and Humor of Robin Williams: A Biography and Robin Williams: A Biography give his birth year as 1952. The Robin Williams Scrapbook also gives a birth year as 1952, as does Encyclopedia Britannica. Williams refers to himself as being "55" in an interview published July 4, 2007 – Monk, Katherine (2007-07-04). "Marriage 101 with Robin Williams". StarPhoenix. หน้านี้แก้ไขล่าสุดเมื่อวันที่ 31 ธันวาคม 2560 เวลา 11:26 น.